Here is a nice holiday gift idea - Chamilia Peppermint Joy charm! It is super cute and it is the perfect charm to wear this season. This is a great addition to the other charms I have. This is my first Christmas theme charm and I love it. Do you collect charms? Let me know which one is your favourite! In case you are looking for a little arm candy this holiday season, Chamilia (www.chamilia.com), a Swarovski company, is launching a new “Peppermint Joy” charm (MSRP $35 U.S.). The sterling silver charm features light oxidation, opaque red enamel detailing, and white SwarovskiPure Brilliance Zirconia and can be paired with any Chamilia bracelet or necklace. I bet this is amazing ! I use to collect charms years ago. This is a cute one. 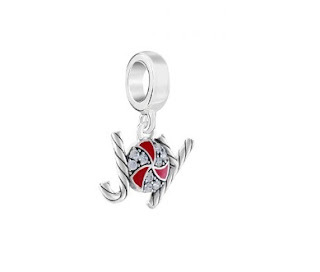 What a pretty charm! So delicate! What a cute seasonal charm!